A beautiful biennial with a range of uses:culinary, medicinal, and insectary, from the roots to the seeds. 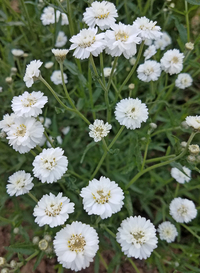 Our particular interest is the beneficial insect attraction it provides in late spring, when the flowering heads are abuzz with frenetic native bees, bumbles, lady beetles, tiny wasps, syrphids, and other natural allies in pollination and crop protection. Makes a dense 3’ tall leafy clump in year one, and a 6’ tall flowering hedge in year two. Makes an excellent self-sowing component to the perennial insectary hedgerow. Combine with Alexanders, Chervil, Chickweed, Chicory, Korean Mint, Kale, Mustards, Upland Cress, and Fennel to create a self-regenerating season-round food supply for you and your wild friends.